An overview of a unique method developed in the 1970’s as an alternative way of reef keeping. Peter Wilkens and the Berlin Aquarium Club developed the Berlin method in the 1970s as an alternative method of reef keeping. Julian Sprung visited Germany in the 1980s and began writing about the success he saw in the tanks of the hobbyists there. 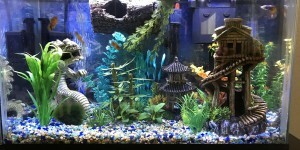 The Berlin method is based on the natural system aquarium developed by Lee Chin Eng in 1961. The largest difference in the systems is the incorporation of protein skimmers in the Berlin method. The basic premise is that live rock is an acceptable media for biological filtration. We all know that nitrifying bacteria coat every surface of our aquariums, they are just found in the largest numbers in our filters. That stands to reason because they have access to high water flow (more food) and oxygenated water. The trickle filters used today are very efficient at processing nitrogenous waste, for our purposes a little to efficient. When biological waste is processed in a trickle filter, there is no place in the filter with a low oxygen (anoxic) area for de-nitrification, processing nitrates to nitrogen gas. In a Berlin method aquarium the live rock is the nitrifying filter and there are many “nooks and crannies” in live rock that gets very little water flow and therefore very little oxygen. The end result is the ammonia is processed to nitrite and the bacteria are right there to process the nitrite to nitrate and then the anoxic areas, where de-nitrification takes place, are right there to process the nitrate to nitrogen gas which subsequently leaves the tank. Just like in the ocean. 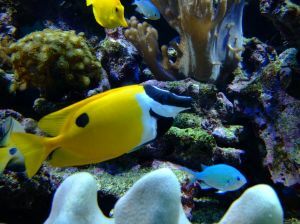 The Berlin method uses large protein skimmers to remove organic substances from the water before they can be mineralized into ammonia, therefore lessoning the biological load on the aquarium. They lower nitrates by removing the substances that cause them before they are processed by the live rock. The Berlin method calls for very strong light as well, but so does every other system out there now. Most say Metal Halide is the way to go, I agree, but I personally have run Berlin systems with VHO fluorescents and PC fluorescents, with tremendous success. The Berlin method calls for calcium supplementation through the use of kalkwasser (limewater), a saturated solution of calcium hydroxide. Kalkwasser has the added benefit of precipitating phosphates out of solution, thereby lowering the phosphates in your aquarium. Care must be used when mixing kalkwasser, it is a very caustic substance with a ph of 12. For best results with Kalkwasser, replace all evaporation loss with a saturated solution on a slow drip at night, to avoid a sudden rise in ph, and it will stabilize your ph at night. Do not mix more than about 5 days worth at a time. Kalkwasser is an ionicly balanced solution, it adds the calcium and the carbonate, thereby buffering the alkalinity as well. Do not get me wrong, I am an advocate of kalkwasser use, but have used other methods of calcium supplementation as well, such as the 2 parts balanced solutions, with good results. It is also recommended that if you do not evaporate enough water to supply your calcium needs that you use a supplemental calcium addition as well. The Berlin method calls for trace element supplementation as well. Specifically Strontium and Iodide. I personally supplement magnesium as well. The Berlin method also calls for good water movement. The animals we are keeping come from areas of the ocean with currents so intricate and powerful we couldn?t possibly replicate them, but we should strive to. Our sessile inverts require the water motion for gas exchange and to rid themselves of excess mucus. Water flow is also required to move the nitrogenous waste to the nitrifying and de-nitrifying bacteria. It has the benefit as well to keep particulate matter in suspension so it can be consumed from the water column by the inverts or removed to the protein skimmer. This method of reef keeping is simple to maintain and setup. It is possible with quality, cured live rock to set up a balanced reef aquarium in a day. I believe in patience in the reef game, but it is possible. When aquascaping a Berlin method aquarium or any reef aquarium for that matter, you should arrange the rock in a loose arrangement to allow good water flow around and through the rocks. This will prevent settling of particulate matter and waste. Another thing while we are on the topic of aquascaping, have fun with it, don?t just build a wall up the back of the aquarium. Use of a substrate is encouraged in a Berlin method aquarium; it adds another area for nitrification and de-nitrification as well as being aesthetically pleasing. Mechanical filtration is frowned upon, it takes out food for the inverts and lessons the efficiency of the skimmer. Water changes are done as well, about 25% monthly. If converting another type of filtration system simply remove the biomedia from the filter, if you have a large system using a trickle filter with a large bio load, you will want to remove the media over the course of a few weeks, a little at a time. This will prevent an ammonia spike. Do you have enough live rock to filter your aquarium? There is no good rule about the amount of live rock per gallon of aquarium water; some rock is denser than others. I have found that if 1/3 to 2/3 of the visible space is taken up in the aquarium in a loose arrangement, it is enough to filter the aquarium and then some. If converting, you should see a drop in nitrates within a very short time.